Aluminum and alloys generally have good resistance to atmospheric corrosion, in marine, urban and industrial environments. Molded under pressure, aluminum enclosures offer many possibilities of forms and treatments of the surface, require little maintenance and resist well in the time. In addition, with a view to sustainable development, aluminum is one of the metals whose recycling is the most economical. Aluminum remelting is only 5% of the energy required to make the metal from the ore. Aluminum naturally overlies with an oxide layer, which protects it most often against corrosion. In neutral aqueous solutions (4 <pH <9), this oxide film has a thickness of 50 Å and protects the metal (passivation). Aluminum is corroded homogeneously only in a very acidic solution, or in an alkaline solution. The strength and stability of the oxide layer depend on the ambient environment, the alloy composition and the microscopic structure of the metal (depending on the heat treatments applied). The electrochemical behavior of aluminum is influenced by the natural oxide film that governs the corrosion. The boxes are massive and thick-walled (2 to 4mm); the corrosion is then superficial and affects only the appearance, without modifying the mechanical strength. In neutral environments, the overall corrosion rate of passive aluminum alloys is very small, but it is never totally zero. It thus keeps a value of the order of 5 μm per year, which can lead in the long run to a gradual change in the surface state to an unsightly appearance due to a change in roughness (orange peel). The most common alteration is in the form of pitting corrosion which develops as cavities of varying depths. This is a very complex phenomenon, the mechanism of which is not fully determined. In common industrial environments, aluminum housings can therefore be used without surface treatment other than deburring and standard vibration polishing. of the envelope or the complete locking of the closure screws. It is galvanic or bimetallic corrosion. makes it much less sensitive to corrosion. to the less reactive (more noble) metal, the cathode, through the electrolyte. depending on the difference in electrochemical reactivity of the anode and cathode metal. their potential difference gives rise to electrochemical reactions and to the circulation of an electric current. negative), and a decrease in the corrosion rate of the least corrodible metal (the most positive). A: An electrolyte bridging the two metals. When the conductivity of the electrolyte is low, corrosion is localized to the contact areas between the two metals. As the conductivity of the electrolyte increases, the corroded surface increases. B: An electrical contact between the two metals. phosphating, paint, oil, etc. ), the current does not circulate, there is no corrosion. C: A difference in potential between the metals to enable a significant galvanic current . D: A sustained cathodic reaction on the more noble of the two metals. For example, stainless steel screws enclosing an aluminum housing will be prone to corrosion due to surface differences. By applying to the cathodic side a sacrificial coating having a potential similar to or near that of the anodic member, the galvanic corrosion is reduced. Zinc plating on steel fasteners will sacrifice the zinc instead of corroding the Aluminum (Potential difference 100 to 200mV). Do not use nickel plated steel fasteners, as the potential difference (450mV) between aluminum and nickel is too high and will corrode aluminum. The corrosion potentials of the stainless steels are “cathodics” and located in the “noble” area and the corrosion potentials of aluminum are “Anodic” and located in the “non-noble” area, with a large potential difference. This means that there will be no galvanic corrosion on stainless steel when placed in contact with aluminum while aluminum will corrode. Although aluminum is anodic to stainless steel, large relative surface areas of aluminum to stainless steel can be acceptable, dependent on local conditions. Stainless steel fasteners in aluminum plates or sheets or massive parts are normally considered safe. Even with no insulation between the metals, there should be little risk of corrosion. In contrast, in a marine environment, severe localized pitting corrosion to the aluminum treads has been observed where un- insulated stainless steel screws were used. Avoid relatively small areas of the less noble metal (Aluminum) and large areas of the more noble metal (Stainless steel). NB: Coupling a relatively wide area of aluminum with a small surface area of a cracked stainless steel part can cause a rapid attack of the material inside the crevice and corrode the stainless steel. 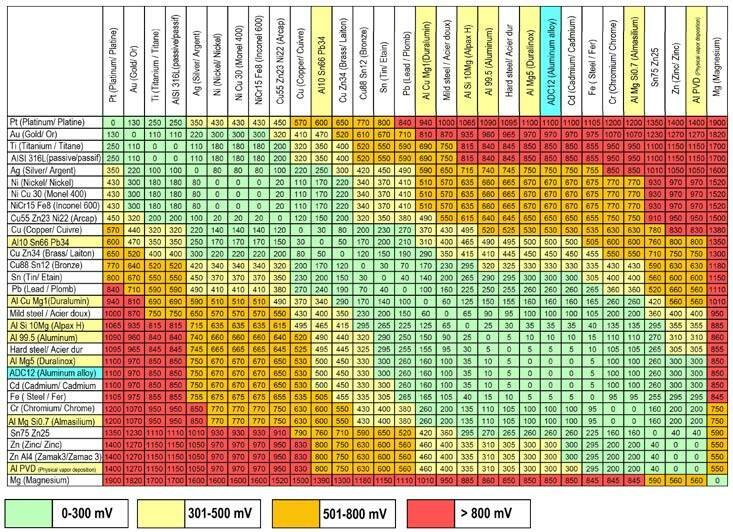 Table of electrochemical voltage between aluminum alloys (Names highlighted in yellow and blue) and other common metals, in a 2% salt water solution. There is no noticeable occurrence of corrosion when the value of the galvanic torque is less than 300mV. To avoid ignition hazards due to impact or friction, standards for explosion-proof equipment (IEC 60079-0) restrict the use of aluminum. The total weight of aluminum + magnesium + titanium should not exceed 15% of the total weight (or 6% of the total weight of magnesium + titanium alloys having no aluminum), which eliminates, for that group, most alloys containing aluminum. For zone 2: no specifications.